By Brandon Anthony: Star Wars‘ was revolutionary when it first came out in 1977, and not only from a cinematic perspective. The film was able to foretell — by piecing together a broad pastiche of sci-fi influences- – many of the most impressive technological feats of today. While we all may not carry working light sabers quite yet, we are closer than ever to mastering many of the tools that appear in the original trilogy. From the digital helpers like “Siri” that live in our smartphones to the commercial spaceflights advertised by the likes of Sir Richard Branson, Star Wars is no longer confined to silver screen. For anyone who fancies a quick trip to space, a new era of exploration and tourism may well be at hand. This summer, NASA selected four astronauts to begin working with The Boeing Company and Elon Musk’s SpaceX to further open up low-Earth orbit transportation to the private sector. With the hopes of building a commercial market for space transportation, NASA’s endeavors could one day help everyday people experience a taste of what the characters of Star Wars feel when they rocket the Falcon “.5 past light speed.” A few minor accidents this year have slowed progress somewhat, but as long as there are enough well-to-do tech moguls out there to continue providing capital support the outlook for commercial trips to suborbital space remains optimistic. If there’s one thing the military does well, it’s invent scary new ways for us to wreak havoc. Battle robots and droids, for instance, are now being used in real wars, though the robots are still controlled from a distance by a human. Many experts predict, however, that the future of warfare may be fully robotic, and the semi-automatic robots used today for bomb disposal and surveillance will be replaced by “droids” that can do our bidding intuitively. While our robots don’t yet look like the B1 battle droids in Star Wars, we are getting closer to robots that can make decisions independently from people – both a thrilling and terrifying thought. For civilian life back home, some of that same automated technology is being used within self-driving cars and other “intelligent” machinery. The encroachment of all these “self-help” tools may one day render many of our most laborious tasks obsolete. Though the technology for holographic virtual reality was invented in the early part of the 20th century, George Lucas was ahead of his time in his onscreen depiction of its maturity. 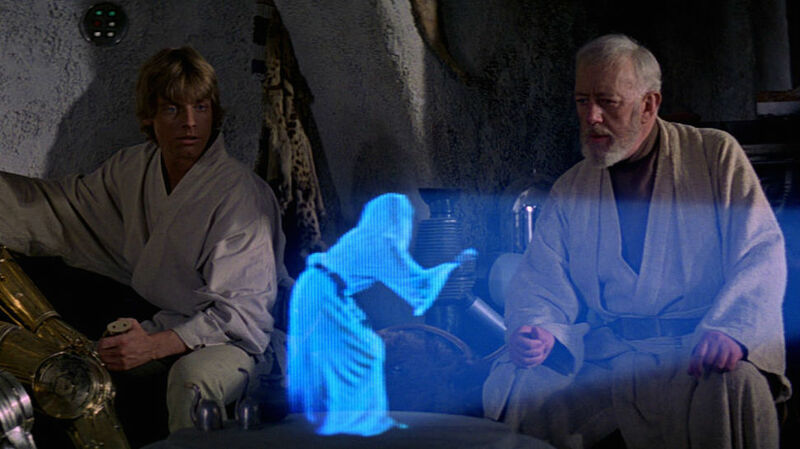 The average person saw “real” holograms for the first time in Episode IV, when Luke received Leah’s request for help. Now, with Microsoft’s developers working to develop a new device called the “HoloLens”, we may finally get a chance to experience high-definition holograms in real life. Though holograms in any form are still not in everyday household use, it’s easy to imagine a future where friends can leave each other holographic messages rather than voice mails. Advanced “power cells” are a reality now as well. Though the science behind them is certainly different then the energy cells in the film franchise, the importance of storing energy in a way that is both efficient and compact is increasingly important for our electrical needs today. Now our advanced lithium batteries smaller, lighter, and more powerful than ever before. According to Dominion Ohio, one of the country’s largest energy providers, battery energy storage may soon be utilized for utility-scale energy storage – allowing us to better store power produced from renewables such as solar and wind. In Star Wars, Luke and his uncle Owen are “moisture farmers” in the deserts of Tatooine; going forward in an era of climate change, Earth’s inhabitants would do well to continue to take a leaf from Star Wars approaches to energy and innovation. Apple’s “Siri” and Amazon’s “Alexa” are today’s AI assistants. Much like C-3PO they were designed for human interaction and are meant to respond to their owner’s requests in as natural a way as possible. Though they currently live in our cell phones or data devices, it is not hard to imagine a future where their software is installed into robots. Nor will it be long before they can think and react independently. At that point we may have an entirely different set of concerns to worry about. With the latest Star Wars still in theaters and continuing to break records left and right, one is left to wonder — how many of the innovations shown in The Force Awakens, will soon be in all of our homes as well? I certainly wouldn’t mind a lightsaber, but the BB-8 has the advantage of also doubling as a cat toy. As they say, the future belongs to those who believe in the beauty of their dreams. This entry was posted in Deep Space 770 and tagged Brandon Anthony, George Lucas, robots, Star Wars by Mike Glyer. Bookmark the permalink. I always thought it was Star Trek, and not Star Wars, that was a driver toward innovation and shaping the technology we strive for. Also, some aspects of Star Wars may have been revolutionary, but “common space travel”, “robots used in war”, “batteries”, and “talking to computers” aren’t on that list of innovations. @Paul: so did I !!!!!!! Long before Siri and 3CPO was Robby the Robot. Yeah, I loved Star Wars with the white-hot passion of someone who discovered it at the Golden Age of SF (13 years old), but none of that “innovation” makes sense to me as something that can be laid, even partially, at the door of Star Wars. I’d say that Star Trek was far more influential when it comes to tech and innovation. And I can’t remember any self-driving vehicles in Star Wars. I love Star Wars dearly. But, except maybe for jumpstarting interest in holographic projection, I don’t think it’s had much effect on technology. It’s real importance is cultural and its reintroduction of swashbuckling adventure to the cinematic world after it had gone out of fashion. As an aside, I think it a little unfortunate that the science was named “holography”, because one would tend to think that the results of holography is a holograph (and I have seen the term used that way) and not a hologram. But “holograph” already has a definition as a hand-written document. So shouldn’t they have called it hologrammy? lol. pretty much echoing all the previous comments; Star Wars did not inspire anything “new”, it merely gathered together a bunch of well-worn tropes that have been with us since at least 1930 and made them bright and shiny. I’ll quietly add, that for many people, George Lucas and STAR WARS was the discovery of science fiction. For many people of a previous era, it was Hugo Gernsback and AMAZING STORIES.. In both cases it was a combination of good and bad. One of the continuing misperceptions about STAR WARS is how many people actually saw it…. The vast box-office in 1977 (and 1978) was largely driven by REPEAT viewings. STAR WARS, in its original releases, was NOT an across the board success. The general public got to know the images largely through magazine coverage, and television clips. I seemed to recall a number of negative reviews as well. John Simon did not care for it. Adjusted for inflation, the original Star Wars is the second highest (domestic) grossing movie of all time. Repeat viewing or not, there have to have been lots of people watching it. Darren, It was not uncommon for folks to see STAR WARS four, six, eight times…. Most Americans to this day, have never seen a STAR WARS movie in its entirety. So, yeah, if there were enough folks like me, only 1/20th of the box office receipts represent individual viewers. Darren Garrison: But telegraphy produces a telegram. Isn’t English a wonderful language? Because there are demographics, but who ever recived a demogram? Don’t they use a Demomometer when polling? I had a friend who saw it 60 times. She abandoned our Star Trek group. I may still be bitter. Who believes these ideas appeared in Star Wars (or Star Trek) first? Taral Wayne: I doubt anybody here does. Though the question of what influenced the future is at least as much about when ideas became widespread as when they were first proposed. In any case, I’ve heard many, many scientists say they were inspired to be a scientist by Star Trek; I can’t say that I remember ever hearing a scientist say they were inspired by Star Wars, though it must have happened. This… is totally a stretch. I love Star Wars as much as the next geek who’s spent plenty of time standing in line and buying toys, but c’mon. While it certainly influenced filmmaking (esp. special effects), revitalized SF cinema, and is Super Fun, it had squat to do with inspiring new scientific stuff. That was Star Trek TOS. Taral Wayne: Who believes these ideas appeared in Star Wars (or Star Trek) first? OK, you win. What’s the correct answer? Murray Leinster? Verne? STAR TREK did not inspire a huge number of staggeringly bad films the way STAR WARS did. I used to say, way back in 1971, that science fiction fans could take over the world. In a way they have, but it seems the feeling in me that it is STAR TREK, and not STAR WARS. There are extremely few films that I have seen “60” times. Most of the are Warner Brothers Cartoons. @lurkertype – actually, it was Amazing Stories, Science Wonder Stories and Astounding Stories of Super Science that gave us the engineers, technicians and scientists that served the technological innovations of the WWII era and ultimately NASA and the moon shots. It wasn’t until the 50s that we got anything approaching “technologically accurate” SF films or television shows (with perhaps one or two probably unintended exceptions). It all really was the “kids” that caught the first wave of SF in the late 20s thru the 30s; everything else “stands on the shoulders of giants” – who do not get anywhere near the recognition they deserve.